Corker: If Pentagon can ‘turn entire countries into craters’ why can't it audit itself? 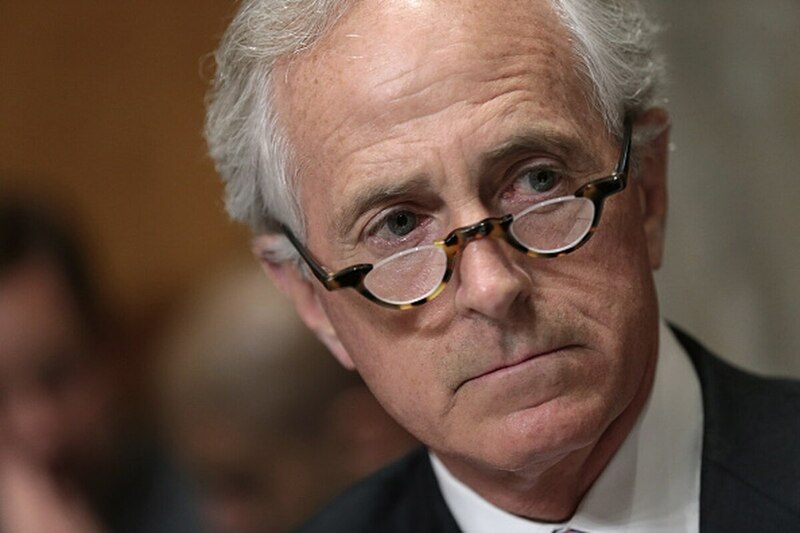 WASHINGTON — Sen. Bob Corker on Wednesday questioned why the Defense Department can “turn entire countries into craters” but has yet to audit itself. “We all watch us kill people remotely in Mosul and other places, people far away, commanding drones. It’s remarkable we can do something like that. DoD has the capacity to turn entire countries into craters, has all kinds of cyber capabilities,” said Corker, R-Tenn.
At a Senate Budget Committee hearing on the ongoing DoD audit and management reforms, Corker—a leading fiscal conservative in Congress—was among lawmakers questioning DoD Comptroller David Norquist and Chief Management Officer John Gibson. Corker was not the only one passionate about defense spending. The committee’s ranking member, Sen. Bernie Sanders, I-Vt., grilled the DoD officials on contract overruns and whether defense firm CEOs are compensated excessively. A comprehensive Pentagon audit is underway for the first time, even though Congress first legislated the requirement in 1990. The annual defense policy law for 2014 mandated the audit begin in 2018. The audit is likely to be the largest audit ever, comprising 24 stand-alone audits and involving 1,200 auditors, Norquist said in written remarks. It has been budgeted at $367 million for fiscal 2018, but Norquist defended the cost. “How in the world is it, in 2018, with all the massive capabilities that the Pentagon has, this is the first time the Pentagon has been able to conduct an audit? What is going on with the culture at the Pentagon, Mr. Norquist?” Corker said. Norquist did not reply, but auditors have found that the Defense Logistics Agency misidentified $465 million of construction projects, that the Army had failed to record 39 Black Hawk helicopters in its property system and that the Air Force failed to record 478 buildings and structures at 12 installations in its property system. Oregon Democratic Sen. Ron Wyden lamented that getting to the DoD audit has been, “the longest running battle since the Trojan War.” Wyden pressed Norquist to estimate how much longer it would for the Pentagon to actually pass an audit, but Norquist demurred.